This image from a selection of Connecticut Museum Wedding Photos shows the bride and her father. The father-daughter pair stand in the Avery Court of the Wadsworth Atheneum Museum of Art in Hartford, Connecticut. Though the museum does not currently hold wedding events, this one was perfect for Connecticut Museum Wedding Photos. The museum is filled with art that spans both historical and modern works. This photograph does not show much of the beauty of that art work; it shows the beauty of a moment shared between the father of the bride and his daughter. Guests mill about in the background of the photo, picking at houdevers and chatting with friends. At the forefront of the image the father of the bride wraps his now-married daughter in a bear hug. It is a moment that is culmination of years of raising his little girl into the radiant woman she is today. He watched her take her first steps, ride her first bike, run off on her first day of school, drive away in her first car, and now he has watched her begin a marriage. His expression is full of pride and love as he holds his daughter close, knowing that when he does let go she will be well taken care of by her husband. 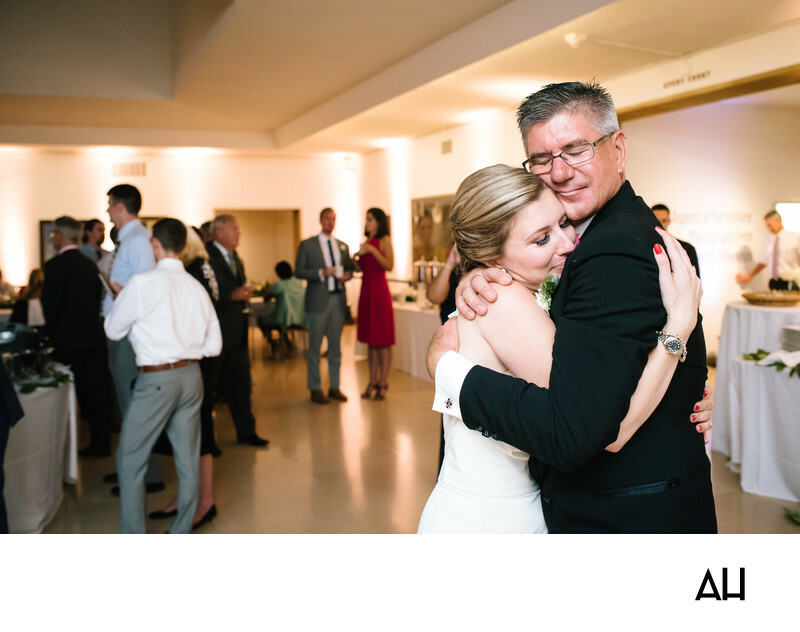 The bride enjoys this moment with her dad, fully appreciating all that he has done for her over the years. On this day especially, she is grateful for the love her parents have shown her and for the example they set for her. The bride knows that she and her new husband will find success in their marriage because she has learned from the wonderful example her parents set of a caring relationship that is rooted in mutual love and respect.